Minnie Parke's Big Date, Dawg! "YO, dis Lucksor Cab Company? Dis Minnie Parke, dawg. Ah's needs uh cab at da L.A. Airport, pronto, yo! Bye." Ah's slammed da public phone back onto its hook. Let me intro' maself. Ah's Minnie Parke, dawg. 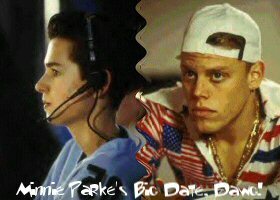 Ah's da sista of da boy band 2getha's Mickey Parke. Dat's ma brotha, yo! Ah's was in L.A. 'cuz Ah's finally gots uh date wit' my dream guy, ma brotha's best friend, Jason "Q.T." McKnight, a.k.a. da young one. Yea, Ah's just called da dude up and told him Ah's like him, and he asked uh sista out. Yea! Da taxi got 'dere 45 minute lata. "Yo, dude, whut took you'ze so long, dawg? Ah's said, 'Pronto, yo!'" Ah yelled at da driva, who spoke, like, 10 words of english, dawg. "Hello. Lucksor Cab Company pleased to help. My name Achmed." Dat was it, yo. Dat da 10 words da dude knew! Made Minnie Parke mad. If you'ze gonna work for somebodys, you'ze gotta know English, dawg! It took da dude a da-yang hour ta find da dudes' crib, yo! Not only did he not know English, he was stupid, yo! Ah's told da foo' da da-yang address tiny-too times, dawg! And finally, da last time, he finally gots it. Crazy foo'. Ah's banged on da door about uh hundred-fitty time befo' Jerry opened da door, lipstick on his face and a crunked-up fro. "Minnie Parke. What are you doing here?" he asked, crossing his arms. "Whut took you'ze so long, foo'? Is Erin in 'dere's? Erin? You'ze in 'dere's, dawg?" Ah's tried ta stick ma head in da door. Erin walked ova, rubbin Jerry's shoulda. "Ah's thought you'ze was here, dawg." Ah's snickered. "What are you doing here, Minnie?" Erin asked. "WHY are YOU'ZE here, dawg? Ta get yo mack on, foo'! Dat's why Ah's here! Ah's gotta date wit' one of da guys, yo!" Ah's yelled. "Yo, foo', whut you'ze doin here?" Mickey pushed his way past Erin and Jerry. "Ah's here ta see Q.T. Ah's gotta date wit' him, yo!" Ah's looked up at ma wack brotha. "Whut? How you'ze do dat, dawg?!?" he screamed. "You'ze gotta date wit' ma best friend, yo!" Ah's could tell he's was 'bout ta hit me. "Wait, Mickey!" Jerry cried. "You can't hit a lady!" Mickey's breath smelled awful, yo! Smell like burned onions, yo! Yuck! Dat ish stank! Brotha didn't look too good, eeda! Musta just got out da shower. Wearin' uh towel, hair was wet, carryin' a toof brush. "That's right, Mickey. You can't hit a lady... unless you do it the right way." A voice said. Jerry, Erin, and Mickey turned ta da sound of da voice. It was ma date, Q.T. He looked fly. He was just wearin' uh black shirt and jeans, but he be lookin' fly. Suddenly, Doug and Chad walked up behind him. "Hi, Minnie." Q.T. smiled, walked out da crib, and took ma arm. "Yo, man, whut you'ze smilin' 'bout? Dat's ma sista, yo!" Mickey cried. "He 'bout ta get his mack on wit' ma sista!" "Yo, Mick, do's a fava, yo!" ah's said. Q.T. slammed da door in Mickey Parke's face. Q.T. took Minnie Parke to a movie, yo... and Minnie Parke DID end up gettin' her mack on! Yea!